Prohibiting Source of Income Discrimination – Direct San Jose Housing Department Staff to bring back an ordinance preventing landlords from refusing to accept subsidies, such as Section 8 vouchers. Read more. Commercial Linkage Fee - This would require a study related to what fees are viable on commercial development that could be used for affordable housing. Added protections to the Tenant Protection Ordinance that include protections for domestic violence survivors, requiring notices about rent assistance, requiring postings related to immigration status, and allowing a person not convicted of a crime to move back in with family. San Jose is one of the most competitive housing markets in the U.S., which makes it difficult for families and individuals struggling to make ends meet to find safe and affordable housing. One way that low-income families find housing is through voucher program, such as the Section 8 program, where low-income tenants pay roughly 30 percent of their income toward rent and the remaining is paid by a government agency. The ultimate goal is to eliminate concentrations of poverty and provide low-income households with access to higher opportunity areas. The voucher program helps families and individuals by offering a method of upward mobility that has been suppressed historically by racist housing policies and works to undo the damage of segregation. Where a family lives greatly determines their quality of life. Higher-opportunity neighborhoods have better access to nutritious foods, better schools, are more accessible to higher paying jobs, and have access to parks, libraries, and community centers. The goal of eliminating poverty and creating opportunity can’t be fulfilled if landlords are allowed to discriminate against voucher holders, turning away tenants explicitly based on their source of income. In San Jose, many voucher holders aren't able to find housing. Many landlords flat out refuse to rent to a voucher holder, oftentimes based on stereotypes. By passing an ordinance prohibiting source of income discrimination, San Jose can ensure low-income families can find a place to live and pursue upward mobility. In Santa Clara County, Section 8 vouchers are the most common form of subsidized housing, with about 17,000 participants. In San Jose specifically, participants are 84 percent people of color, 50 percent live with a disability, and 13 percent are families with children. 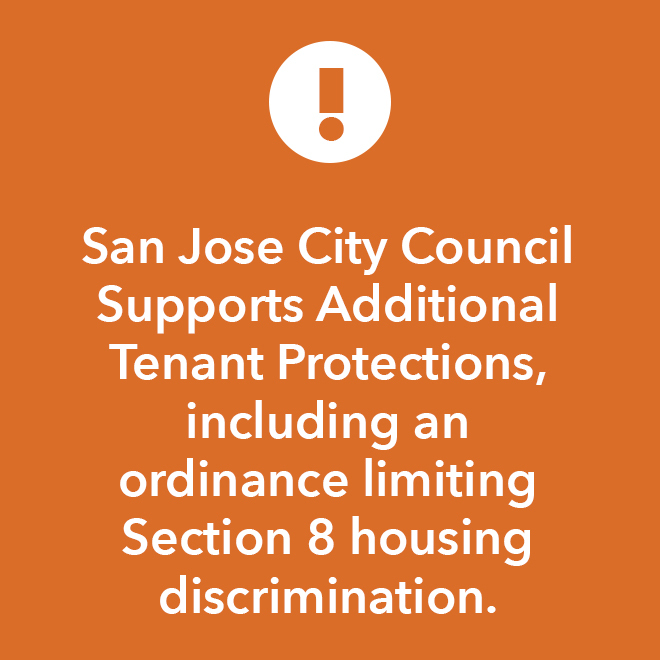 On Tuesday, December 11, San Jose City Council is voting on a list of additional tenant protections, including an ordinance prohibiting discrimination based on source of income, requiring landlords to consider anyone with a voucher just as they would any other tenant. Landlords would also be prohibited from using advertisements that specifically exclude tenants who have vouchers. Additionally, landlords would not be allowed to impose different terms and conditions on voucher participants, such as asking for higher rent amounts. While landlords would still be able to consider legitimate reasons for not accepting a tenant, such as credit history or history of evictions, the ordinance would make it so that income-based discrimination is not allowed by law. This would help many families who face rejection after rejection, hung up phone calls from landlords, and missed appointments – all while their living situation remains in limbo. A number of states have passed Source of Income Discrimination Protections including Connecticut, Maine, Massachusetts, New Jersey, North Dakota, Oklahoma, Oregon, and Vermont. And cities in California have joined as well with San Francisco, East Palo Alto, Santa Monica, Corte Madera all enacting protections prohibiting discrimination based on source of income. Studies have shown that voucher holders living in communities with source of income ordinances are more likely to find housing. 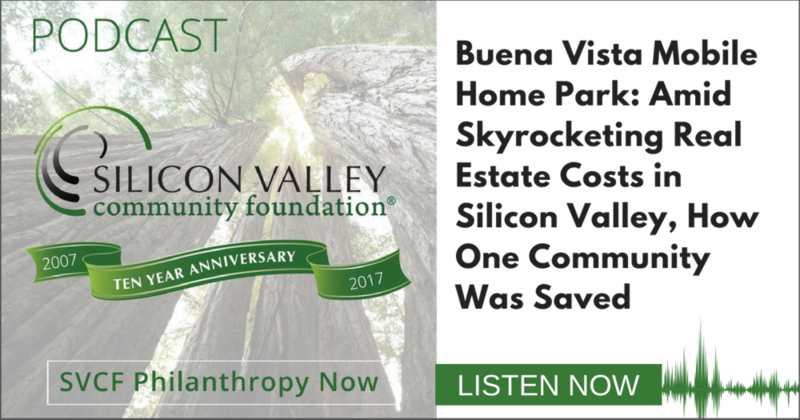 Law Foundation of Silicon Valley attorneys have been advocating for increased tenant protections, including a source of income anti-discrimination ordinance, because at the core of our work is a belief that safe and affordable housing is a right.